Around 15 officers of Pasar Minggu Sub-district's Water Resources Sub-dept. 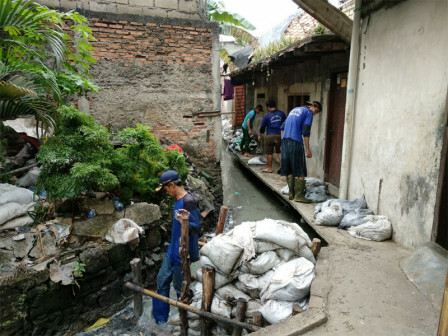 Executing Unit, South Jakarta has dredged a connecting channel of National University (Unas). It is aimed to smoothen the channel that is strewn by mud that has reached 1 meter length.
" We dredged the channel that has 700 meters length," he expressed, Monday (7/16)." Pasar Minggu Sub-district's Water Resources Executing Unit Head, Chairul Anwar stated cleaning is carried out from Kejagung Complex Park until Family Mart. "We dredged the channel that has 700 meters length," he expressed, Monday (7/16). He uttered the officers had difficulties in the field, whereby many citizens throwing household waste into the channel. "That's why it is divided into per segment to do dredging," he told. It is targeted to be completed within one month. Because of obstacles in the field, the work time had to be added. "Thus far we've dredged up to 300 meters," he said.